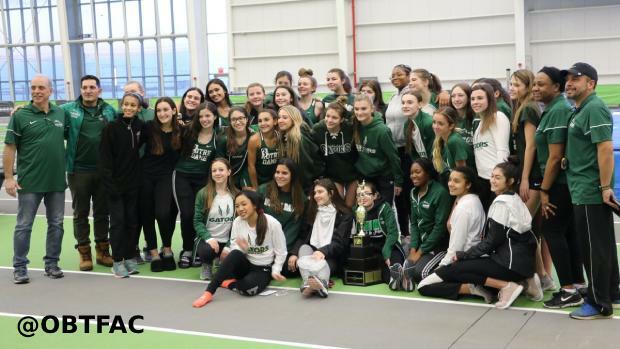 Sierra Dinneen was at it again this past weekend, scoring a big double for Notre Dame Academy as they successfully defended its Staten Island Indoor championship title at the Ocean Breeze indoor complex. It wasn't easy, as the defenders had to fight off a gritty Susan Wagner squad (103-95), with the meet not being decided until the last three events. NDA was a well-balanced squad, and they had Dinneen, who took two gold medals, and was voted the meet's Outstanding Track Athlete. Sierra Dinneen is a slim, soft-spoken 5 feet, 5 inch, 105-lb. junior at Notre Dame Academy, the star of a team and program that has come a long way in the past four years. With personal bests of 2 minutes, 14.38 seconds in the 800, 2:55.92 in the 1,000, 4:40.42 in the 1,500, and 5:00.74 in the mile, Dinneen has established herself as one of the rising middle-distance stars in the New York metropolitan area. And she's also the Staten Island record holder on the venerable 2.5-mile Van Cortlandt Park course, having run 15:02.73 at the CHSAA Sectional championship meet this past fall. She has been the star of a program that has suddenly thrust itself into contention for team championships on the track. Dinneen has been guided by her coaches, Al and Youree Garcia, who have a wealth of experience in track and field. Al Garcia starred at Mount St. Michael Academy in the Bronx, where he won three CHSAA titles on the track. He continued his career at St. John's University, running under 4:10 for the mile, while being a member of the school-record 4x1,500-meter relay. After college, he became the Puerto Rico national outdoor champion over the 1,500-meter distance. Wife Youree did even better. A star at Maria Regina High School, she blossomed into one of St. John's all-time great female athletes, winning 12 Big East titles in the sprints, and twice being named the Outstanding Athlete at the Big East championship meet. She was recently inducted into the St. John's Hall of Fame. The Garcias, parents of four daughters, are a true track family. The eldest, Pariis, who represented Puerto Rico at the Pan-American Games, was a many-time Big East champion in the 200 and 400, and duplicated Mom's feat by being named the Outstanding Athlete at the Big East indoor championship meet. Brianna competed for St. Peter's University, while Ariella, a former CHSAA champion at 800 meters, is a sophomore running at the University of Maryland- Baltimore County. 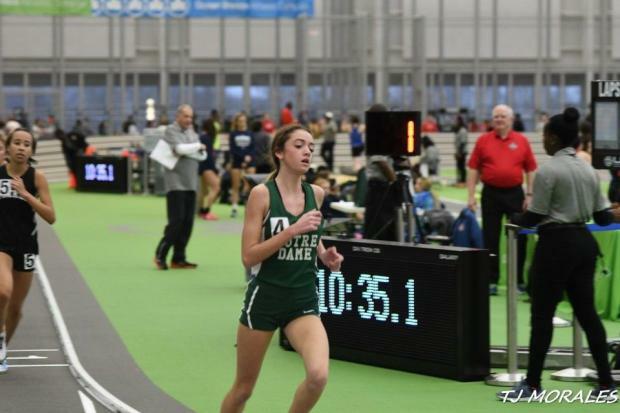 Rounding out the family is Sofia Garcia, a junior at NDA, who won her first Island championship on Sunday, squeaking out a close win in the 600-meters. Success doesn't happen by accident, and a variety of factors have contributed to the Notre Dame success story. NDA, a school of 450 girls, located in the Grymes Hill section of Staten Island, operates without a track. At one time, year-round training took place at Clove Lakes Park, with girls running on pavement throughout the winter. There was no field team, and few sprinters. But NDA had Youree and Al Garcia, who served as volunteer assistants for long-time coach Dom Tringali, and became co-head coaches in September, 2015 when Tringali retired. Notre Dame had never won an Island championship on the track, and had won only one Island championship in cross country in 20 years. That changed quickly. The Garcias wanted to build a complete team, one that could contend for championships. That meant a large, well-rounded team. "You're only as good as your last ninth-grader," said Al Garcia. Both Youree and Al Garcia knew that the sport had changed. Youree Garcia said, "We don't know everything, so we are constantly looking for ways to improve, while her husband said, "We've changed the warmup, the drills, everything." With no track, the Garcias received a double godsend. With the construction of the magnificent Ocean Breeze indoor complex, the indoor training problem was solved. And for outdoors, NDA now practices at Wagner College, less than a half-mile away. And there was plenty of administrative support from principal Kate Jaenicke, a former NDA runner, and from parents, who have flocked to the new local facility. But the biggest part in the team's development was the formation in 2009 of the Island Express Track Club, with Al Garcia being one of the founders. Island Express is a club that caters to the development of young athletes, and with four young girls in the family, the Garcias enthusiastically jumped at the chance to provide wholesome recreation and fun for their daughters. Al Garcia kept the entire operation low-keyed. "We practiced twice a week, exposed them to light training, and if the kids liked it, we started to pick up the intensity a bit in the seventh and eighth grades." One who showed some early promise was Dinneen, who ran a respectable 2:26-800 meters as an eighth-grader. She handled the big jump to high school competition well, placing third in the CHSAA varsity cross country championships as a freshman, and winning the Island varsity cross country titles in both her freshman and sophomore years. Things came somewhat apart at this year's Island cross country meet. Construction at Clove Lakes Park necessitated course changes, and Dinneen, running far ahead of the field, took a wrong turn and was later disqualified. She got back into the gold-medal groove, opening her season with a win in the two-mile run at the Bishop Loughlin Games, and on Sunday scored victories in the 1,000 and 1,500-meter runs for the second year in a row. "I wasn't feeling real good before the races, so I decided just to go for the wins," she said. She opened up large leads in both races, winning both easily, though Susan Wagner sophomore Kathryn Altieri narrowed the gap over the final two laps of the 1,500. "I just wanted to get the lead, and run the last 300 in both races," said Dinneen. Off Staten Island, Dinneen faces tough competition within the Catholic High School Athletic Association. Junior Maggie Maier of Sacred Heart won the CHSAA Intersectional cross country title, and NDA was a close third in a tight four-team battle. 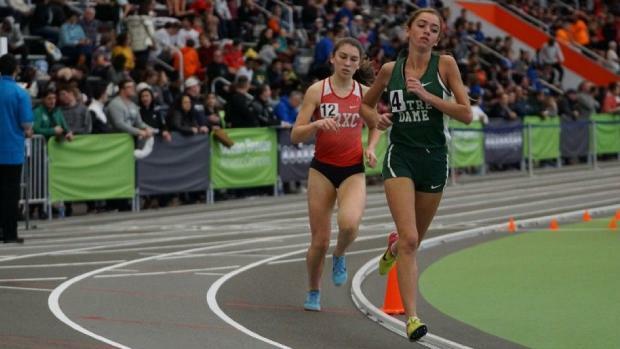 The two traded wins at last year's indoor Intersectional championship meet, with Maier winning the 3,000, and Dinneen getting the better of her Long Island rival in the 1,500. Dinneen has the highest respect for Maier, saying, "It's always a battle with her. I think we push each other. I know she pushes me to my best." Since the Garcias took over the program, NDA is unbeaten in Island championship competition. The Gators won their first Island indoor and outdoor titles ever in 2015, and haven't been beaten since. They also captured four CHSAA Intersectional cross country titles, with their streak being broken in November, where they placed a close third. 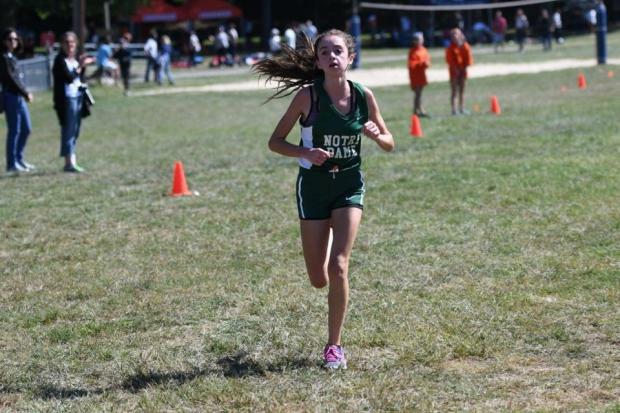 NDA's dynastic aspirations are fueled by Dinneen, but there are other promising athletes. 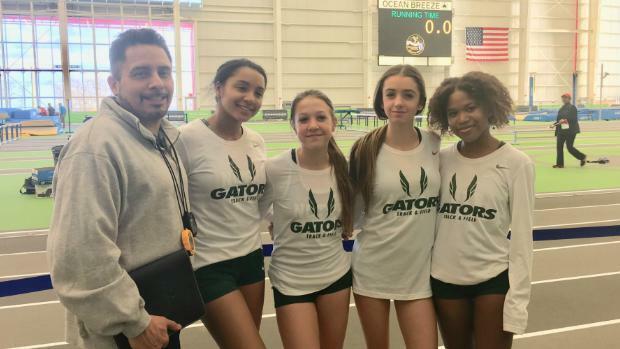 Soph distance runner Giavanna Comerford, freshman Alyssia Brown, and soph pole vaulter Aileen Hoban give NDA hope, not only on Staten Island, but in the CHSAA, where they've been knocking on the door since 2015. Youree and Al Garcia know what it takes to win championships. Having experienced success at a high level, they pass on their knowledge to their athletes. Dinneen trusts her coaches, saying, "I know what kind of athletes they were, so when they give me advice, I try to use it." The junior star wants more this year, and is aiming higher. Listing her immediate priorities, she said, "I'd like to go under 2:10 for the 800, break 5:00 in the mile, and qualify for the National Indoor meet, and help my team make All-America in at least one relay." Al Garcia added, "Sierra can be a very good athlete. She's quiet, she listens, and she executes."